We are starting something new every Wednesday starting March 2, 2016 from 10:30 am to 12:30 pm. We will be getting together to make “Knitted Knockers”. Knitted Knockers are special handmade breast prosthesis for women who have undergone mastectomies or other procedures to the breast. They are give out for free for women who request them. When I was a child I explored everything. Within my family we did all sort of crafts. My mother and grandmother did all sorts of needlecrafts as well as my great aunts and great grandmother. The handmade was just a part of our lives. I did not sit ideally in front of the TV; in fact we were only aloud to watch one program a night. Come and join us Wednesday February 17 from 5:30 pm to 6:30 pm for a Yarn Tasting party. What is a yarn tasting party? It is a way for a knitter to try a variety of yarns and fibers, without the financial investment or commitment of buying a whole skein. In my many years of teaching classes a certain problem reoccurs over and over again. It is frustrating for the teacher as well as the student. The student has failed to achieve the required knitting to move on to the next step; they fall behind and more often then not they give up on the project all together. Are you off on a grand adventure and need something to do on the plane before you reach your destination? Might I suggest the humble sock, this is an excellent plane project. Small and portable, you can throw them in your carry-on. You no longer need to use double point needles for socks, my favorite needles to use are 12” circular, but there are many other methods such as the magic loop as well as using two circular needles. If you use two circular needles I find it easier to have one needle longer then the other. With this method and the magic loop you can work two socks at a time. We have many wonderful colors of sock yarns to choose from and if you are looking for a little more of a challenge in your sock knit we have many patterns with textured designs in the sock. So don’t be bored on the plane to your great adventure. Pick up your needles and some beautiful sock yarn and knit your way there. The days are getting longer. It is very exciting; before long, the spring flowers will be in bloom. We still have snow on the ground and it can be very icy on my daily walks, but all in all, things look hopeful. To celebrate, I have started knitting with one of the spring yarns that arrived a few weeks ago. Colorful, this type of hat is especially fun to knit because of the frequent color changes and the variety of patterns in one small hat. Though for many, the shaping at the top of the hat often causes some confusion. Now that you have decided to take the plunge into Fair Isle, knitting let’s talk a bit about the best yarn to use. In my opinion, there is nothing better to use for Fair Isle knitting then a Shetland wool. We have February as Fair Isle Month. 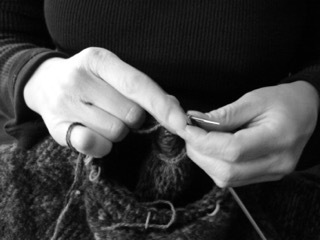 Have you ever been curious about Fair Isle knitting? Join us in February to discover the exciting world of Fair Isle. Our cottons and cotton blends have started to arrive.